Though many Danes bike, there is still potential to get even more people to bike and to give those who already do so better conditions. The Danish research project, Bikeability, comprises a number of studies that give recommendations as to how to make this happen. Here are some of the latest results. More than 80% of Danes have a bike at their disposal. 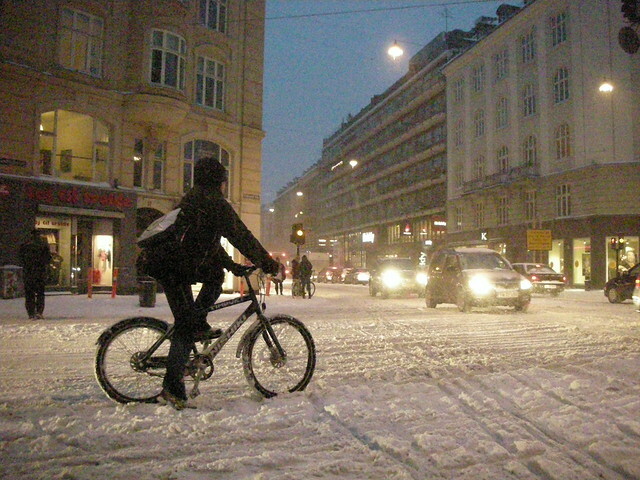 Thus, cycling is common among Danes, and most know how to bike even though they may not use the bike as their daily mode of transport. Overall, however, cycling has decreased in Denmark over the last 20 years. However, cycling in Copenhagen has increased. According to the municipality’s bicycle account, 36% of all trips to place of work or study in Copenhagen are taken by bike. This development is presumably due to the fact that Copenhagen has worked determinedly to promote cycling. Graphic: Index of the development in Denmark’s work to promote cycling and the number of bikes in central Copenhagen (the graph is based on the weather-adjusted counts). The Bikeability project has examined cyclists’ route choices in two ways: 1) By observing their behaviour via GPS, and 2) by presenting them with descriptions of route alternatives and asking their preferences. Some of the preliminary results of the GPS survey show that the average bike ride is 5.4 km and lasts 22.4 minutes (with an average speed on 14.4 km/h). The cyclists prefer to go straight. If they have to choose, they would rather turn right than left. With regard to the average bike ride, they would take an 85-meter detour to avoid a left turn while they take a 50-meter detour to avoid a right turn. Cyclists are willing to bike further in order to ride on a bike track. If you look at a bike ride with no bike tracks, it appears that, on average, cyclists make a 1.8 km detour if they can go on a bike track along the entire route. When respondents were asked to choose between various routes, the attitude towards streets with bike tracks corresponds to that of the GPS survey: On a standard bike ride of 3.5-7.5 km, people were willing to go an extra 1.7 km to ride on a bike track. Cyclists were also ready to take a 0.4 km detour to avoid crowded bike tracks and many stops (traffic lights, etc.). Our surveys share similar outcomes with previous analyses that focussed on walkability, indicating that population density, intersection density, and land use mix have a positive effect on how many people choose to bike. The Bikeability project also shows that a flat terrain and nearby purchasing opportunities increase the likelihood of cycling in an area. Finally, the results show that good connections to public transport or good options for walking instead of cycling have a negative effect on cycling. The Bikeability project is funded by The Danish Council for Strategic Research and wraps up at the end of 2013. Visit www.bikeability.dk where you can find links to articles, slides, and more.